The growth of container traffic at Russian ports, although still in double digits, is slowing down in 2018. According to the Association of Russian sea commercial ports, during the first 6 months of the current year the container throughput of all Russian ports was 2.5 mln TEU, which is 11.6% up from the last year’s figures of the same period, however the growth in 1H 2017 was higher: +15.3% to 1H 2016. The slowdown is also noticeable as compared to the first quarter of 2018, when the increase in volumes was 12.6%. Imports keep growing: +11.8% (1.1 mln TEU), although, again, not so fast as last year, when the rise was 17.3% in January-June and as in Q1 2018 (+14.6%). Exports are also on the rise: +11.9% (1.066 mln TEU), but the growth in the same period of 2017 was 15.4%. Here, we notice a peculiar difference in the trends of this year. Loaded exports have increased by 14% (655.2 th. TEU) and evacuation of empty boxes by just +9.6% (410.4 th. TEU), whereas in H1 2017 the tendency was exactly the opposite: full export boxes grew by 8.7% and empties – by +26.1%. The growth rates are lower also in cabotage volumes (+9.8% (342.3 th. TEU), in H1 2017 it was +10.5%) and in transit (+6.8% (34.5 th. TEU), in H1 2017 it was +12.8%). The slowdown is noticeable in all Russian port regions, except the Baltic ports. From January through to June 2018, St. Petersburg and the nearby ports handled 1.25 mln TEU, which is +12.5% to H1 2017, whereas last year the rise was just +9.5%. This year’s increase is attributed to a strong growth of full exports (426.3 th. TEU, +19.4%) and that of imports (631.8 th. TEU, +11.7%). The Big Port of St. Petersburg handled almost half of the country’s traffic – 1.09 mln TEU (+13.7%) – thus confirming its status of Russian container hub #1. The Far Eastern ports, which last year demonstrated the highest increase of all Russian ports (+26.4%, 683.57 th. TEU), now handled 777.9 th. TEU, or +13.8%. Last year’s growth here was achieved due to a huge a surge in imports: +44.6%, but this year the rise in import traffic is rather less: +15.9% (240.8 th. TEU). 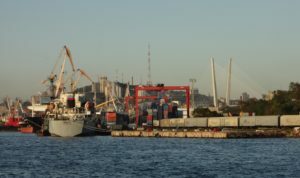 The Black Sea ports grew in January-June 2018 by just 6.8% (429.99 th.TEU). Their growth last year was 17.3%. As we wrote earlier, the Russian ports are nowadays recovering from the dramatic drop of 25.4% in container volumes in 2015, when the economic sanctions declared by the Russian government, the grossly devaluated ruble and the following economic crisis led to a 28.5% decline in imports. However, the data of the first half of 2018 indicates an obvious slowdown in the growth rates.